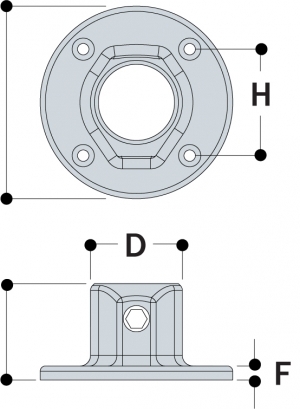 This flange, with holes provided for countersunk head fixing screws only, is used in structures where the fixing required is positional only. Frequently used as a wall fixing bracket. 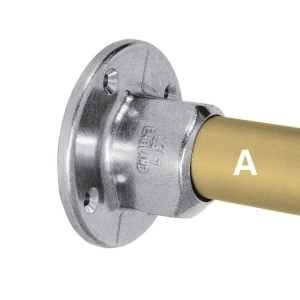 Ø indicates diameter of fixing holes. It is not recommended for use as a base flange to support guardrail or balustrades (see Type 62). L61-6 0.46 lbs. 6 1.61 in. 1.97 in. 0.31 in. 3.94 in. 1.93 in. 0.24 in. L61-7 0.64 lbs. 7 2.09 in. 2.17 in. 0.31 in. 4.33 in. 2.4 in. 0.24 in. L61-8 0.7 lbs. 8 2.36 in. 2.36 in. 0.31 in. 4.72 in. 2.64 in. 0.24 in.